While in Japan I worked on a number of trees which might make it to future posts. 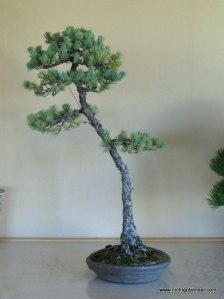 One such tree was a bunjin style white pine that had been bought by the nursery as part of a larger collection. It had been styled by the previous owner but with far too thin wire so it was up to me to re-wire and find a new style for the tree. Oyakata gave me free rein on the tree and so I set about working. As the tree began, styled by its previous owner.